What did Zinfandel really want to be? Before the late 1960’s, California was all about cheap dessert wines- White Port, Tokay, Sauternes (skid road sweet wines). Only a handful of producers made varietal wines and they were largely limited to Chardonnay (then called Pinot Chardonnay) and Cabernet Sauvignon. When the first varietal revolution began in the late 1960’s, Zinfandel was in the mix. Ridge Vineyards produced their first Geyserville in 1966. Then Zinfandel took a strange turn and White Zinfandel, a semi-sweet blush wine took center stage. In the next varietal revolution (circa 1973), Zinfandel regained its position as an ultra-premium varietal and high quality producers introduced some of America’s greatest Zinfandels ever. The class of 1973 was remarkable and clearly put the varietal on the map. But its place in the world marketplace was met with mixed results. Old World fans and many in the restaurant trade decried the high alcohol of the wines (pushing 16%) and the world returned to the tried and true: Cabernet Sauvignon and Pinot Noir. These were classic red wine varietals that would never become high octane monsters. Zinfandel was pushing its power and ripeness and bringing in a little heat along with it. At the most recent ZAP (Zinfandel Advocates and Producers) week, this past January, the organization put on the Zinfandel Experience to show the world Zinfandel as it is today and where it is going in the future. I participated in a trade/media and consumer event at ZAP, tasted over 120 wines (many more than once), spoke with vintners and consumers. The playing field has changed. The wines, though high in alcohol, were balanced and delicious. Vintners were passionate about producing wines that tasted great and were true to their AVA’s (American Viticultural Area). Upscale consumers were excited and enjoying the wines. On the trade/media panel I commented that alcohol should not influence you either way on how you will or not like a wine, it is all about balance and how it tastes. As I talked with the public, they were passionate, coherent and thrilled at the state of Zinfandel today. I enjoyed so many wines at the tastings. Here are three in my top group that are available at Wine.com. The easy and super-rich ’12 Cline Ancient Vines is a perfect match with grilled pork ribs – but make sure the sauce is not too spicy. The sophisticated and red-fruited ’12 Ravenswood Dickerson calls for oven baked roast pork, with a savory red wine reduction sauce. The classic and brambly ’12 Dry Creek Vineyard Old Vine will pair well with a rosemary-accented leg of lamb. 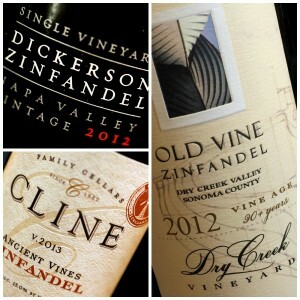 It is time to recognize that Zinfandel has come home and is waiting to pair with a fine meal with family and friends.